NetStat: displays a list of your computer's inbound and outbound network connections, including the information on open TCP and UDP ports, IP address, and connection states. What makes it different from other NetStat utilities is the ability to map open ports to the owning application. Configurable alerts for incoming and outgoing connections are also available. NBScan: a powerful and fast NetBIOS scanner. NBScan can scan a network within a given range of IP addresses and list computers offering NetBIOS resource-sharing service, as well as their name tables and MAC addresses. 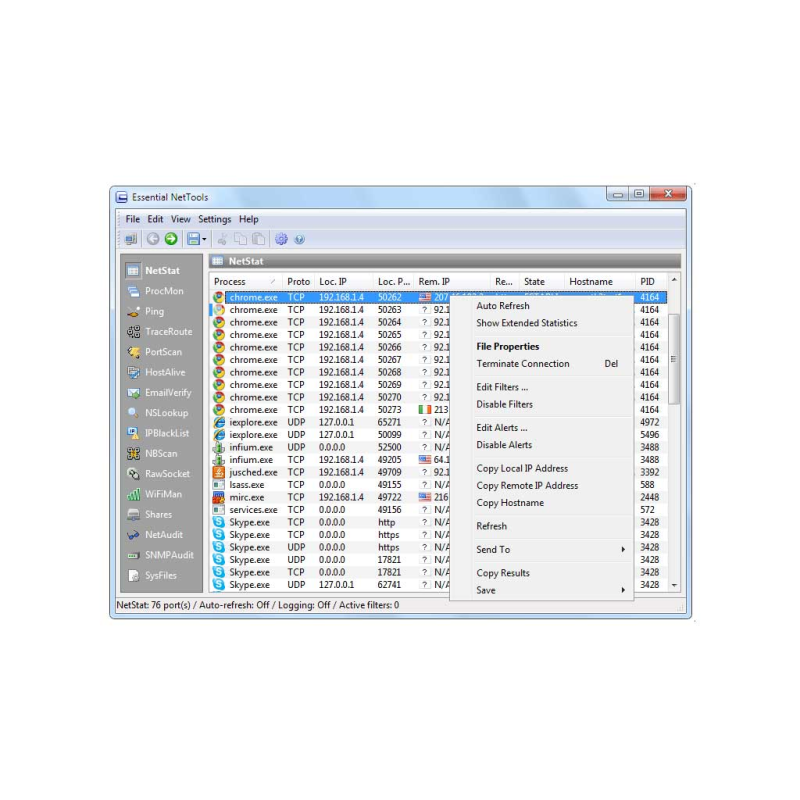 Unlike the standard nbtstat utility supplied with Windows, this tool provides a graphical user interface and easy management of the lmhosts file and features parallel scanning, which allows checking a class C network in less than one minute. NBScan can facilitate routine tasks often carried out by system integrators, administrators, and analysts. PortScan: an advanced TCP port scanner that allows you to scan your network for active ports. This tool features both conventional (full connect) and stealth (half-open) scanning modes. HostAlive: a network monitoring tool that periodically checks if a host is alive and running network services, such as an HTTP or FTP server. EmailVerify: checks if an e-mail address is valid by communicating with the corresponding mail server over SMTP. Shares: monitors and logs external connections to your computer's shared resources, lists local shares, as well as provides a quick and easy way to connect to remote resources. SysFiles: a convenient editor for the five important system files: services, protocol, networks, hosts, and lmhosts. NetAudit (NetBIOS Auditing Tool): allows you to perform various security checks on your network and/or individual computers offering the NetBIOS file sharing service. This tool can help you identify potential security flaws. RawSocket: provides you with the ability to establish low-level TCP and UDP connections to troubleshoot and test different networking services. Multi-color output and a convenient interface make it a great tool for every network administrator or computer programmer. WiFiMan: shows wireless adapters installed on a computer, lists available wireless networks and allows you to manage connection profiles. 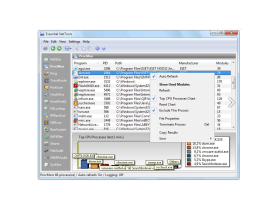 TraceRoute and Ping: these familiar utilities featuring customizable options and convenient results presentation allow you to explore the Internet and troubleshoot connectivity problems. NSLookup: allows you to convert IP addresses to hostnames and vice versa, obtain aliases, and perform advanced DNS queries, such as MX or CNAME. IPBlackList: checks if an IP addresses is included in various IP address black lists: SPAM databases, open proxies and mail relays, etc. This tool helps you figure out why a given IP address is rejected by some network resources, such as mail servers. ProcMon: displays the list of running processes with full information on the program location, manufacturer, process ID, and the loaded modules. With this tool, you can view CPU utilization statistics, identify hidden applications, kill running processes, and manage the usage of your PC's resources more effectively. SNMPAudit: Advanced SNMP device scanner. 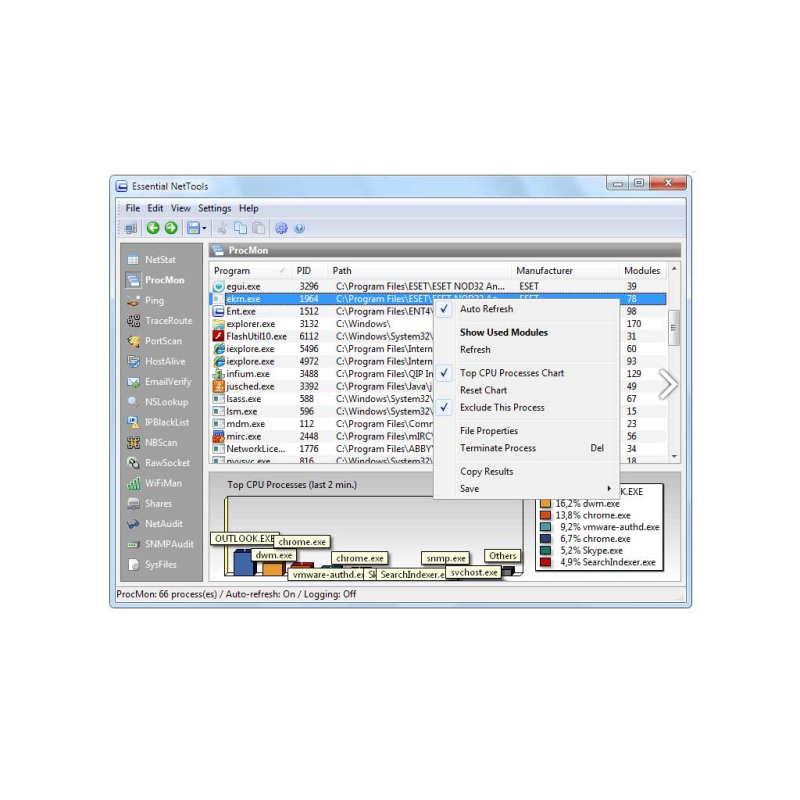 It allows you to locate SNMP devices in the selected network segment quickly and receive customizable data sampling from each of the devices. 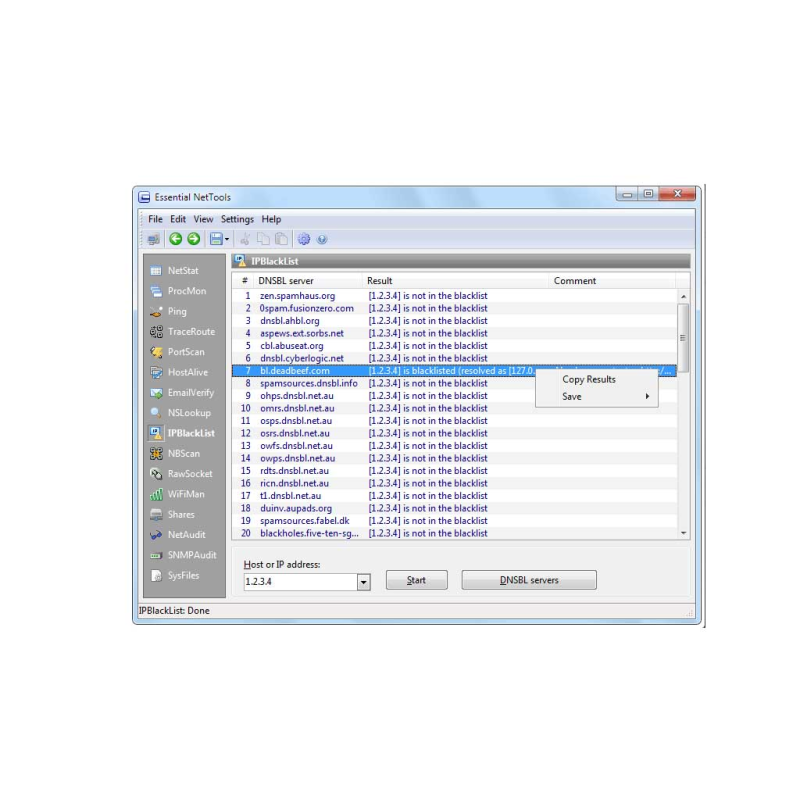 You can use SNMP browser for examining a device in detail. Other features include report generation in HTML, text, and comma delimited formats; quick IP address sharing between different tools; IP address geolocation; a comprehensive System Summary window; and a customizable interface.